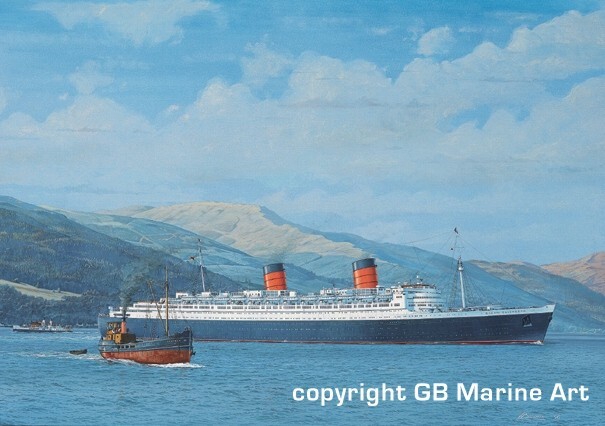 In 1946, the mammoth task of restoring Queen Elizabeth from grey troop carrier into the stateliest of liners was shared between the Clyde and her home port, Southampton. Cunard allowed John Brown & Co, the Elizabeth's builders, just 10 weeks to transform the vessel's structure as she lay at anchor at the Tail o' the Bank. The most striking aspect of this work, as the liner's drab wartime coat was chipped away, was how in stages from bow to stern, she gradually emerged in gleaming Cunard colours. The ship then sailed for Southampton to be re-united with her original furnishings and for dry docking. On her return to Scotland, the revitalised vessel was joined by Her Majesty Queen Elizabeth and her two daughters, Princesses Elizabeth and Margaret, for speed trials off Arran. 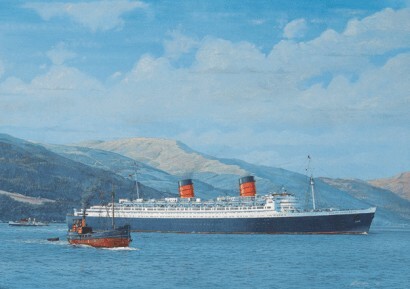 These successfully completed, the liner headed back to her old war-time anchorage off Greenock. En route, as she cleared the broad bend on the Clyde opposite the Cloch Lighthouse, the early evening sun highlighted the sleek Cunarder's shining new paintwork. Framed by the autumn-tinted hills, she shared the moment with PS Jupiter and the little steam puffer, Ardfern.